The US has been spying on Japanese cabinet officials, banks and companies, including the Mitsubishi conglomerate, whistleblowing website Wikileaks says. Documents released by Wikileaks list 35 telephone numbers targeted for interception by the US National Security Agency (NSA). The surveillance extends back at least eight years, Wikileaks said. Wikileaks has previously released files showing the US spied on Germany, France and Brazil - like Japan, all allies. There has been no comment from Japan on the latest claims. 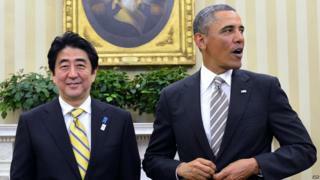 A Wikileaks statement said the latest revelations "demonstrate the depth of US surveillance of the Japanese government". The documents, marked "top secret", reportedly show that the US was listening in on conversations at Japanese government ministries and offices. Wikileaks says the US was aware of Japan's internal discussions on issues such as trade talks, climate change policy and nuclear and energy policy - as well as the contents of a confidential briefing in Prime Minister's Shinzo Abe's residence. The US also reportedly spied on Bank of Japan officials and on the fossil fuel departments at Japanese firms Mitsubishi and Mitsui. Wikileaks says the NSA shared the information it had gathered with Australia, Canada, the UK and New Zealand - the so-called "Five Eyes" group.